Detta är Patrik Lagers blogg med reflektioner, ideér och goda råd till alla som jobbar med Data warehouse och Big Data. Blogginläggen är Patriks egna och behöver nödvändigtvis inte representera Top of Minds åsikter eller ståndpunkter i alla ämnen. Earlier this year had a wonderful time when I was on vacation in Barcelona. 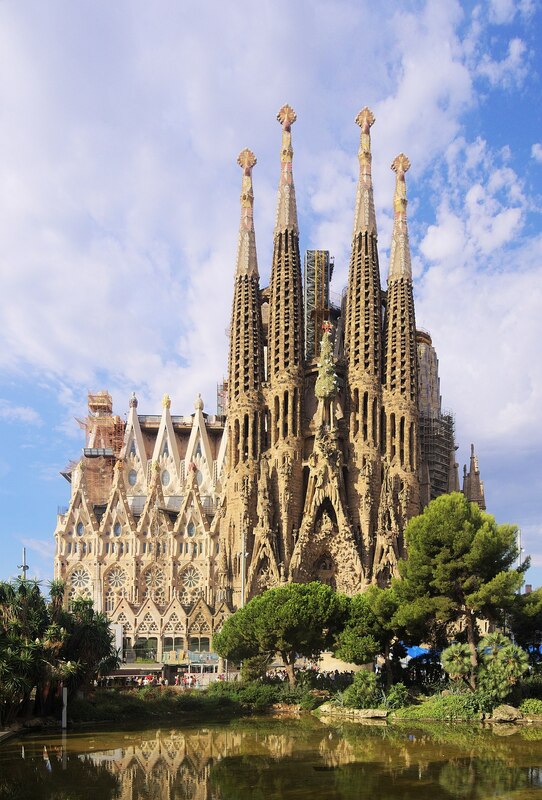 One of the things I visited was La Sagrada Familia. The amazing cathedral in Barcelona, designed by the famous architect Antoni Gaudi, I recommend a visit if you ever is in Barcelona. After I came home I started to think about issues I often find when I come to companies and looks at their Analytical system(s), it is often a mess and when you ask an architect for a blue print of their vision/architecture of what they are to achieve with the analytical system(s) they are building, the documents are often on so high level that it can’t be used support any design for what they should build or it is a chart of what tools they should use or a list of reporting requirement. I find it very strange that in our industry, analytical system design and implementation, there is a very strong ad hoc approach. I would say that analytical systems are one of the harder things to design and implement in such way that it is maintainable, scalable and have a long life span. I would say that without a vision/architectural blue print of how/what/when/were/why data for analytical use is to be produced and consumed is such way that the solution will be stable over a long time, you will not succeed, long term. Some would blame the agile movement when it comes to project/sprint approach but I disagree. Once again, the La Sagrada Familia, is a project that has been ongoing for over 100 years and is planned to be fully finished by 2026, 100 years after Antoni Gaudi died but the Cathedral is functional today and can hold service and also be used as a huge tourist attraction, so it is already delivering business value even it its built one sprint at a time, but still the blue print vision/architecture is followed, they know what to build and how and when, since they have a blue print to follow, knowing what needs to be achieved. One great example is that the highest tower, the mid tower, is not built yet, but the pillars that shall hold up the tower is already designed and built to handle the stress of the mid tower when it is built. Without the vision and the blue print that would not have been done. So is this possible in our industry? I would say that it should be mandatory to get that blue print in place before you build anything, the blue print is not about the exact analytical function, but on how the system framework should work, how things should be implemented and where in the architecture they should be implemented, and what we want to achieve with this system, from a non-functional requirement view. We need to be engineers in our mindset, not “coders”, everything can be solved with code, but it is seldom maintainable and/or scalable in the solution as whole. The mentality – let’s try it out and see if it works, will not create a stable, maintainable analytical system, neither will the approach – the end user wants this, so let’s build exactly that, without understanding how it affects the whole system, will also fail from a long term perspective. One thing that I think drives our industry into the “coding/build” mentality instead of the “engineer/design” mentality, is that we are one of the few industries that gets payed to redo bad solutions. That is not very common, in other design/building industries, there you are responsible of your design/product and if you made something wrong, you will have to redo it – without payment, you might even be sued for more money since you might have wreaked some ones daily work or living. So you take care, and think it through on a full scale before committing to building anything. But our industry don’t have to design or plan how our solution will work in a whole, because the people hiring us, will pay us to redo it later, they might even pay us three, four, five times to get it right and then after a few years pay us again to rebuild the whole solution because it was not scalable and/or maintainable, since we didn’t really understand how the whole system should work. Our accountability is almost none existent. So before we build our next analytical system(s), please get the non-functional requirements inplace, draw the architectural framework and set the how/what/when/were/why things will happen in the architecture, before we build the first analytical function/report. The blog series is aiming at explaining how and why we need to build an Analytical Systems in a specific way, if we want them to have maintainability, scalability and longevity. In the previous blog post we looked at the history of building analytical systems and how in the early 90’s we came to the conclusion that we need an “Associative Component” in the architecture to handle the many to many relationships between source data and user groups requirements. Now the definition can be interpreted in many ways, I will here describe my view of what this definition means and why it is important from an Analytical system design perspective. Subject Oriented or Subject Area Oriented is an important part of how an Analytical System are organized. For the Associative Component in the Analytical System Architecture we organize and handle our data in subject areas. This way we always know where to get certain kinds of data, independent of source of data. If we would store data according to source of data we would end up with a lot of various places to pick up data if the question about data spanned over multiple sources for a specific data concept, which most of the queries in an Analytical System does. It might feel like a very small thing, but this is a fundamental part of designing and building an Analytical System. Then main reason why the subject area approach is so important is that it gives the analytical system the ability to disconnect the dependency between the source of data and the end user requirements. Since the sources of data that enters an analytical system is not created by the analytical system itself. It is dependent on the underlying systems that feeds it data. The underlying sources of data can and will over time be changed, and even removed from the IT landscape and replaced by new systems. If we build a direct dependency on specific source data and they change or even replaced, you will have a much broader effect on the analytical system than if we build it with an Subject Area Associative Component. Integrated can be seen as three different areas of integration. Structure (Subject Area), Instance and Semantic. That means that we create a data representation in the Associative Component that has the same Structure and semantic representation independent of source system. I break it down in 6 levels, where each level is fundamental if the Associative Component will hold the data in a format the remove the many to many dependency between Source and User. Which is the really important if you want to build an Analytical System that is maintainable, scaleable and have a long lifespan as a system. Sourcing: The fundamental part of an analytical system is that we need to get our hands on the data. This can be done in many ways, but we do need to have the ability to use data from various sources. Subject Area: This is also called co-location of data. We organize data from various sources according to what Subject Area it belongs to, not by each source. Instance: This is a very important part of integrated, it’s about, that if a data instance within a Subject Area exist in multiple sources, the Associative Component in the analytical system has to have the ability integrate the various sources and only have one instance of it. Example, if a Customer exists in multiple systems and they all send data about the Customer the Analytical System should only have one instance of that Customer, independent of how many sources has information about that specific Customer. Attribute: The various sources of data often has their own naming conventions on the attributes. The Associative Component on the other hand has to keep its data according to one naming convention. This to make it possible to access data independent of source system. Domain Values: Certain Attributes has their stable values – it is like a list of values that a certain attribute can use. The source often has their own list of values that certain attributes can use, these must be translated as well. Otherwise you can’t really access the data independent of source. Format: We want the format for different type of data types to be the same, like date format. There are multiple ways of representing a date, but the Associative Component should have one. If you handle data according the definition of the Associative Component instead by Source it will cater for a much stronger scalability, maintainability and a longer life cycle of the Analytical System. Base line – Eight systems handles product information that thirty different analytical functions has been coded against, there are reports, statistical models and AI scripts using the data. Now we add a new source system of product data. Source by Source – All thirty analytical functions have to be rewritten to handle the new source. Associative Component – One system has to be mapped into the Product Subject Area and Integrated according to the six levels of Integration. Use Cases are untouched. Source by Source – Nine different sources have to be mapped and understood in regards of the requirement of the analytical function. Then nine different sources of data have to be handled in the code, merged and integrated be the developer of the analytical function. The developer also need deep understanding on how each source systems works and all its legacy in its data to come up with a correct result. Associative Component – The developer accessing the subject area for product and need to translate the requirement to that subject areas data definitions. The developer need to understand the data model of the Product Subject Area but does not need to understand each and every source system. These simple examples show the fundamental strength of the Associative Component when it comes to handle changes between the many to many relationships between the User and the source of data and simplify the usage of data. This way the Analytical System can grow and change both on the Source side as well as the User side and the Associative Component will help mitigate the effect of the change and in the long run create a more efficient development cycle. If you want to build an Analytical System that is be scalable, maintainable and have a long-life span, you need an Associative Component in your Analytical System architecture. This series of blog posts will discuss system architecture and design principles to build an analytical system with maintainability, scalability and longevity. Further on, discuss the details in the design principles to give the analytical system agility, reusability and robustness. These principles have been learned and explored the hard way, through empirical experiments (building analytical systems) and observing the results over the last 40 years of what works and what does not work. To understand why the principles of architecture and design of an analytical system are what they are, we need to go back in history before we knew what we know today. In the 70’s and 80’s the data systems got more and more common. They were built to support different operational processes in the business. Even at this time the business understood that in all that data that was gathered in these operational systems there was knowledge to be used to support decision making. So, they wanted to use that data to understand how the company was doing. One issue was that the operational systems where fully occupied to support the business process and any analytical query against it would ruin its operational performance. The solution was to offload the operational system on to another platform. Just copy the tables/files every month or so to the other platform and someone could start running queries against the data without disturbing the operational system. Once the knowledge was extracted out to of an operational systems data, more questions from the business started to appear and these questions could not always be answered by data from one operational system, so we needed to off load data from more operational systems, this was done into the same platform as the first system, just by copying each operational systems tables/files. So the Copy System came to be, the first analytical system. Now there was a system that had data copied from multiple operational systems. The data was stored according to the operational systems data models. Since the Copy Systems were very much an afterthought in the IT landscape and there were no good architectural design principles for how to build and maintain these systems, they often had big problems of handling change of requirements for queries and problem when the underlying systems, who’s data that was copied, changed. These problems would escalate as more systems was copied and more query requirements where implemented. What is the fundamental challenges of building these analytical systems then? It is that there are two sides in the system (Ingestion and Access) and they have a many to many relationships between them. This is a major difference between building an operational system and an analytical system. An operational system supports specific business processes. These processes have clear steps on what they want to achieve. The input of data in clearly defined and the output is well defined. The number of use cases/scenario the system should support Is limited and the user group of the system is well defined and limited. On the other hand, an Analytical system has many different data sources and a lot of different user groups with a lot of different requirements to support multiple different processes. This means that the analytical system does not know all the different requirements/use cases it will have to support in its life cycle. So how do you then design a system that does not know what requirements it is supposed to support? In the early days (70’s, 80’s, 90’s) the architecture looked like this, or the lack of architectural design patterns made it look like this. As we can see it is a mess of spaghetti lines with multiple dependencies on data and usage of data. Any time a new requirement/use case entered the analytical system, new lines of dependencies between users and data sources was created. This was of course not maintainable or scalable over time as new requirements and systems came in. So how do we handle these many to many relationships between Ingestion and access? We look how it is done in a data model, where we add an associative component when there is a many to many relationship. I have not seen it called that way any other place, but it is one way to describe what this componet in the architecture is meant to do – mitigate and handle many to many relationshipes between source data and user requirement. Now the definition of that associative component is the important part on how to build an analytical system. Bill Inmon gave us that definition in the early 90’s and it still stands. In the next part of this blog series I will describe my view on what the definition means and why it is so important if you want to build an Analytical System that will be maintainable and scalable over a long-time frame.